This Winter 2014 edition of the Grenoble Ecole de Management (GEM) Energy Market Barometer documents the French energy experts’ estimates of the future electricity mix in France and in the European Union, their assessment of the regulatory conditions in France for investments in energy technologies, and their expectations about the development of energy and CO2-certificate prices. The GEM Energy Market Barometer Report (Baromètre GEM du Marché de l'Energie) is a twice-yearly survey of energy market experts from industry, science, and public administration in France. These experts are asked to provide their assessment of short, medium and long term developments of national and international energy markets. Typically, some survey questions are designed in close collaboration with the ZEW, the Center for European Economic Research, which has carried out a similar barometer for Germany. This report is based on a survey that was conducted in December 2014 and included 107 participants from France. This report may also be downloaded in French. The future electricity mix in France and in other EU countries has been a contentious topic in light of political targets for greenhouse gas emissions, energy efficiency, and renewable energies. Groundbreaking energy policy decisions were made in Paris and Brussels in October 2014, and Grenoble Ecole de Management's Winter 2014 Energy Market Barometer survey seeks to better understand the current state of the energy market given these developments. The first major energy policy change occurred when the French National Assembly adopted the Energy Transition bill in its first reading. Among other initiatives, this bill aims to reduce greenhouse gas emissions 40% compared to 1990 levels by 2030. It further targets a 50% reduction in final energy use by 2050 compared to 2012, an increase in the share of renewables in the French energy mix to 23% by 2020, and to 32% by 2030 (in 2012 this share was 13.7%). In particular, the share of nuclear in the electricity mix is scheduled to decline from 75% to 50% by 2025. In order to be more in line with EU directives, the bill also paves the way for a new support system for electricity generated from renewable energy. This system will gradually move away from the current feed-in tariff scheme, which guarantees operators of renewable energy installations a fixed selling price, and toward a system with a market price element. Second, the EU Council agreed to cut greenhouse gas emissions in the EU to at least 40% below 1990 levels by 2030. This target is expected to keep the EU on track to cut its emissions by at least 80% by 2050. Achieving this target would be an important contribution to efforts to limit average global temperature change to 2°C. The Council further agreed to a binding target for renewables to make up at least 27% of the EU's overall energy consumption in 2030 (in 2012 this share was 14.1%). The council further agreed to an indicative target for energy efficiency improvements of at least 27% in 2030 compared to a baseline. In view of these decisions, we asked our experts about their expectations on the distribution of fuel types within the overall electricity generation of both France and the EU in 2030. The energy market experts expect, on average, the share of nuclear power in the French electricity mix to drop by 16 percentage points from 74% at present to 58% in 2030. Only a quarter of the experts believe that the share of nuclear power will be 50% or lower in 2030, 5 years later than the target year set in the Energy Transition bill. The declining share of nuclear power will mostly be replaced by renewables (other than hydropower). These renewable energies are expected to almost quadruple their share from 5% (current) to 18% in 2030. The share of hydropower in the French electricity mix is expected to remain fairly constant. Natural gas and coal are expected to almost double their share by 2030. During the same period, the share of coal is expected to be cut in half. Nuclear and coal power currently dominate the EU power mix, with shares of 27% each. Our energy market experts expect the share of coal to drop by 10 percentage points by 2030. Similarly, the share of nuclear is expected to drop by 5 percentage points. In comparison renewable energy sources (other than hydropower) are estimated to almost double their share from 13% currently to 25% in 2030. Renewables are expected to become the dominant source of electricity generation in the EU by 2030. This 25% share is only slightly lower than renewables' 29% share in the projections made by the International Energy Agency's (IEA) in its 2014 World Energy Outlook of the EU's overall electricity generation in 2030 using their central scenario. This central scenario takes into account the policies that had been adopted as of mid-2014 together with relevant policy proposals. However, this 25% share is also about 10 percentage points lower than what is called for in the IEA's policy scenario capable of limiting global warming to no more than the 2°C target. Companies' decisions to invest in energy technologies in the energy sector not only depend on the market conditions but on regulatory conditions. Financial incentives such as subsidies, energy and CO2 taxes, tax credits, low-interest loans, procurement policies, or feed-in tariffs and non financial incentives such as performance standards, information and education programs, labeling schemes, or the regulation of grid access affect research, development and deployment of energy technologies. More than two-thirds of our experts think that current regulatory conditions are favorable for investments in energy efficiency, i.e. either very favorable (8%) or rather favorable (60%). In addition, the vast majority of the French energy experts expect the regulatory conditions related to energy efficiency to improve over the next five years. Arguably, this finding may be due to additional measures which have already been proposed in the context of the French Energy Transition, such as implementing stringent buildings codes, promoting positive energy buildings, and improving the existing "Energy Efficiency Credit" system. Likewise, new EU regulations require large companies to carry out an energy audit at least every four years starting in 2015, and establish new energy efficiency standards for household appliances such as big-screen TVs. Unlike for energy efficiency and renewable technologies, the experts are rather divided over current and future regulatory conditions for investments in nuclear technologies. Both the share of experts who consider current regulatory conditions favorable and those who consider them unfavorable hovered just over one-third of the respondents. Although the Energy Transition bill foresees a substantial reduction in the share of nuclear in the French power mix by 2025, only 43% of the experts expect the future regulatory conditions for investments in nuclear technologies in France to worsen. For natural gas, most experts (51%) consider the current regulatory conditions rather neutral and about equal shares as consider them poor (27%) or favorable (22%). Two-thirds of our experts expect the future regulatory conditions for natural gas to remain unchanged and about one-quarter expects them to improve. Natural gas fired plants are particularly well suited to provide the operating flexibility needed to accommodate the planned growth in fluctuating renewables (i.e. wind and photovoltaic) in the power system. Finally, most experts consider current regulatory conditions for investments in coal technologies negatively, as either very poor (25%) or rather poor (39%). The GEM Energy Market Barometer regularly surveys the expectations of energy market experts on the development of energy prices in the wholesale market and on the price of CO2 certificates. For electricity and coal prices, the short- and medium-term expectations of the energy experts in our panel are very similar to those of the previous survey carried out in June 2014. That is, most experts in our panel expect the prices of coal and electricity to remain stable over the next six months. Over the next five years, the vast majority of experts expect the price of electricity to increase, and about half of the experts expect the price of coal to remain unchanged. Since our previous survey in June 2014 the $ price of oil dropped by about 30% by the time the current survey was carried out (December 2014). This decrease is attribuable to sluggish economic growth, cheap substitutes (e.g. exploration of unconventional oil and gas in North America), and OPEC's (mostly Saudi Arabia's) refusal to cut output. This steep drop in the price of oil has come as a surprise to most experts. In the June survey only 3% had expected oil prices to fall over the next 6 months. In the current survey about half the experts expect the price of oil to (further) drop over the next 6 months, while about 40% expect no change in the price of oil over that period. In contrast, 74% of the experts expect the oil prices to rise in the next 5 years. This share is similar to the findings of the previous survey, where 77% believed that the oil price would increase over the next five years. Thus, the experts have adjusted their expectations for the price of oil in the short term but not in the long term. Regarding short-term gas prices, we observe similar but less pronounced adjustments in the experts' expectations compared to oil prices. About half the experts think gas prices will remain constant over the next 6 months (compared to 58% in the previous survey) and 30% think gas prices will decreases over this period (compared to 10% in previous survey). 60% of the experts expect gas prices to increase over the next 5 years (compared to 68% in previous survey). In sum the majority of the experts in our panel consider the current low oil and gas prices to be a temporary phenomenon. By regulating the greenhouse gas emissions of large energy and industry installations (and also airplanes) the EU Emissions Trading System (EU ETS) is the EU's main instrument to meet its climate targets. 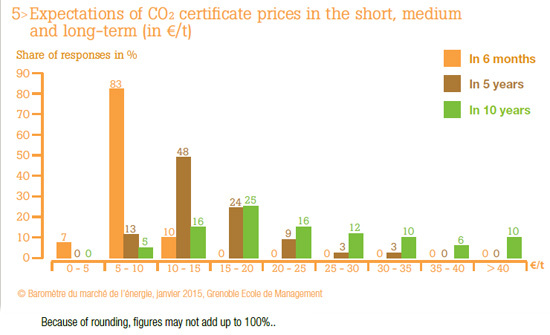 Yet, current prices of CO2 certificates of about 7 €/tonne (in January 2015) are rather low. Our experts expect the price of CO2 certificates to remain low over the next six months and to increase over the next 5 and 10 years. The median price is in the 5-10 €/t category for the short term, in the 10-15 €/tonne category for the medium term, and in the 20-25 €/t category in the longer term. The somewhat higher prices in the longer term are likely to reflect the fact that the new 40% reduction target for 2030 is more ambitious for the installations covered by the EU ETS than the existing 20% reduction target for 2020. To further increase CO2 prices and to restore shortand long-term confidence in the carbon market, the European Commission has proposed introducing a market stability reserve as a form of stabilizing mechanism. Fewer than one in four experts believes that the target to decrease nuclear power’s share of the French power mix to 50% by 2025 will be met. The share of renewable energy sources (other than hydropower) in the French power mix is expected to almost quadruple by 2030. Renewable energy sources (other than hydropower) are believed to become the dominating source of electricity in the EU in 2030. About two thirds of the experts think that current regulatory conditions in France are particularly accommodating for investments in energy efficiency and renewable energies. Experts are divided over how supportive current and future regulatory conditions are for encouraging investments in nuclear power in France. Electricity prices are expected to remain stable over the next six months but to increase over the next 5 years. Oil prices are expected to continue to decrease over the next six month, but increase over the next 5 years. CO2 certificate prices are expected to rise only in the medium to longer term but levels remain rather low.